Want some inexpensive picture frames for your decor, but don't want the expense? Save your calendars and select florals, scenes, etc. to accommodate your living decor. You may have to crop and cut them to fit behind the 5 x 7 and 8 x 10 inch opening mattes. Buy cheap frames and you have your own inexpensive artwork. Great in groups of three in a hallway, etc. You will be able to afford to change them with the seasons for a different look! These make nice little friendship, hostess, or housewarming gifts too. Note: I would not suggest selling these for profit as there might be copyright laws involved. Cute idea. I love the bear in the fur coat! My husband worked for a paper company and got some beautiful samples of paper with artwork and calendars. I saved a really big calendar with a beautiful photo of flowers, lots of red in a black vase. I ordered a bunch of old gold wooden frames on ebay and found that one of them fit the photo just fine. I painted it black and rubbed off some of the paint to let the gold shine through. Then I modge-podged the photo to give the illusion of an oil painting, so it didn't need glass. I did put it on a mounting board. It hangs in my entryway. Calendars are expensive, but some have very beautiful pictures in them. I wait until January and they instantly become half price, then choose one or two that I like for the beautiful pictures in them. 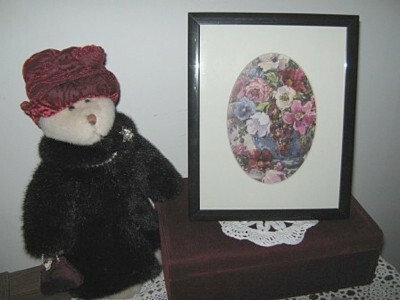 I purchase very inexpensive picture frames (some even from local dollar stores) and cut out the best pictures and frame them myself for some very unique one of a kind art. Also if you wait until March, I find if any stores (like cards or book stores) will mark there calendars down to $1.00 each. Just remember that when you do wait until March, you're limited with what's left, fewer choices. The sad thing is that a lot of retail stores actually throw the old calendars away. It's not always the choice of the store though. The retail store where I work actually gets called by the supplier telling them to throw them away. I asked if there wasn't a way that we could donate them to a school or day care center or anything, but the company required them to destroyed, and the store could be fined, and the supplier would not sell to them the next year if they found out that they were not destroyed. How sad and wasteful! And besides that, it was only Feb! All calenders, planners and appointment books -- destroyed!